Hybrid Technology combines the benefits of both water cleansing and oil cleansing for a more thorough clean. This multi-benefit product removes makeup, cleanses the skin without drying, leaving it feeling soft and refreshed. Formulated with special hybrid technology, it cleanses skin of dirt, impurities, excess oils, pollen and dust that can settle on skin from makeup and harsh environmental conditions. Plus, moisturizing compounds provide a more gentle cleansing so skin is hydrated at the same time. Thoroughly cleanses pores of even the finest dirt, dust and particles that can build up and cause irritation. Cleanses skin of environmental pollutants that accumulate. Neglecting skin, by not cleansing or sleeping in makeup, is a leading cause of premature aging. Formulated with keratin and is to be gentle on eyelash extensions as well as natural lashes. Lashes are cleansed and conditioned without damaging or splitting them. leaves it smooth and hydrated. This multi-benefit gel glides effortlessly onto skin, dissolving quickly as it removes dirt, makeup and other impurities on face and within pores. Skin will look and feel smooth and hydrated, not sticky or tight. A component extracted from the rose honey of the peach flowers of Bulgaria which is naturally fermented with acetic acid bacteria. Helps in creating a smooth and soft skin, laying no burdens on the skin. A skin conditioning emollient that preserves and maintains the dermis. Offers a smooth texture which prevents rough skin and helps to maintain healthy looking skin. Place a small amount of QuSome NanoOff Cleansing onto your palms. Spread QuSome Nano Off Cleansing across entire face and soak it into makeup by gently massaging in circular motion from the inside to the outside. Rinse well with lukewarm water to completely remove. After rinsing, cleanse face with Clay Wash.
*For better results, use before rinsing face. *If product gets in eyes, rinse thoroughly with room temperature or lukewarm water. Consult a doctor if pain or inflammation occurs. *When using waterproof mascara or eyeliner, please use eye makeup remover. *If you have dry skin and/or sensitive skin, please test a small amount on your skin first. Q1 How does it differ from typical oil and gel type cleansing methods? Our Gel Cleansing is a new and refreshing process of using both oil cleansing ingredients to efficiently and thoroughly remove makeup and water cleansing ingredients to wash off aqueous perspiration, dust, and pollen. Since makeup and other particles can be removed from within pores, it's also ideal for preventing acne and blackheads. Q2 Is it possible to use on sensitive skin or when it's not in the best condition or on acne? Yes. Our Gel Cleansing removes makeup and impurities from the skin harmlessly, thanks to technologies that are exclusive to b.glen. Since makeup, pollen and small particles that cause inflammation are also removed from pores, it prevents acne and rough skin. Q3 Can QuSome NanoOff Cleansing be used with eyelash extensions? Yes. QuSome NanoOff Cleansing contains ingredients that are safe to use on natural eyelashes. It also takes in to consideration possible damage caused by false eyelashes and eyelash extensions. For sensitive areas around the eye, please softly and carefully acclimating QuSome NanoOff Cleansing with makeup. *QuSome NanoOff Cleansing may not be used with certain adhesives (glue) and bonding attachments. Q4 I have been using a cleansing product from another company and am considering a switch to QuSome NanoOff Cleansing after hearing about it. Will I see an improvement in skincare results if I use it together with other b.glen products? 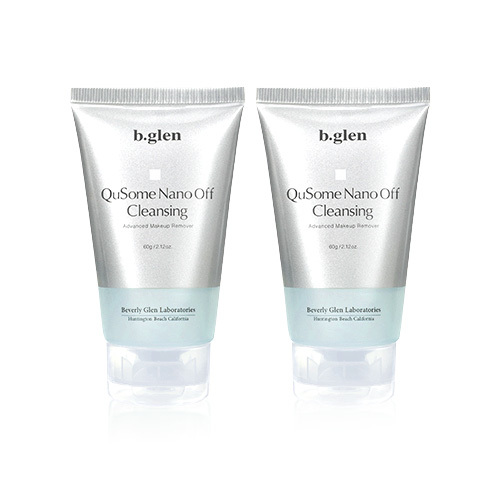 QuSome NanoOff Cleansing includes features that adjust the stratum corneum (outer most layers of skin) which strengthens the ability of other b.glen products to penetrate their skincare ingredients deep into the skin. Our skincare product always work better together and it's the best way to ensure your skin is receiving exactly what it needs after a long day of wearing makeup and accumulation of pollen and other air pollutants on the skin.